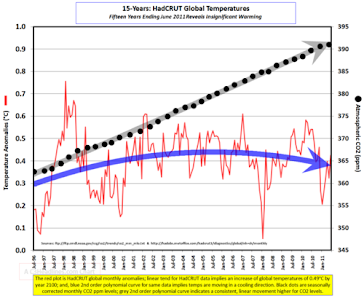 Peter says that because of UHI and data corruption the only reliable temperature record now is the one produced by U.S. weather satellites measuring global atmospheric temperatures. 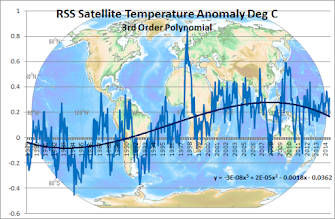 Such satellites have only been in operation since 1979, but show no increase in global temperature trends until the unrelated El Nino spike of 1998, with temperatures declining back down since then. He is critical of the US media who unlike their UK counterparts have largely ignored negative stories on global warming . American media outlets like Time and Newsweek are still disgracefully reporting the arrant nonsense from global warming fabulists that the record snowfalls pummeling America this winter are actually due to global warming. In America, we can no longer even get the news from the political activists posing as journalists at our major media outlets, which can no longer be distinguished from the Democrat National Committee. Who is helping and how? Air: Carbon dioxide is a greenhouse gas. Too much carbon dioxide in the air makes Earth get warmer and warmer. TEMPERATURE: Even a small rise in Earth's global temperature means melting ice at the North and South Poles. It means rising seas. It means flooding in some places and drought in others. It means that some plants and animals thrive while others die. SEA ICE: What is happening to the ice? SEA LEVEL: What if it keeps rising this fast? If the ice keeps melting, global sea level could rise more than 20 feet. That would put a lot of coastlines under water. Whole islands could disappear! Throughout Earth's history, whenever the amount of CO2 in the atmosphere has gone up, the temperature of Earth has also gone up. The point is, if the greenhouse effect is too strong, Earth gets warmer and warmer. This is what is happening now. Too much carbon dioxide and other greenhouse gases in the air are making the greenhouse effect stronger. Well, after observing and making lots of measurements, using lots of satellites and special instruments, scientists see some alarming changes. These changes are happening fast--much faster than these kinds of changes have happened in Earth's long past. You can see how CO2 levels change with temperature. Look at what it is doing now. The map above of the southeastern U.S. shows in red the area that would be under water if sea level were to rise by 20 feet (6 meters). Climate change can be a daunting topic for most adults to grasp, let alone kids. That’s why we’ve just launched the kids’ version of our website, called “Climate Kids”, to help. Concerns were expressed about the expected date for the final disappearance of summer (permanent, all-year-round) sea ice in the Arctic, as a result of warming in the region, and the potential for that becoming a climate change ‘tipping point’. …along with sea level rise due to melting ice sheets.